How Much More Debt Next Week, Wayne? Over the past 6 weeks since I began tracking the AOFM’s government debt auctions, Wayne’s pack of lunatics have borrowed no less than $2 Billion, and as much as $2.75 Billion. And we can see here, that ever since JuLIAR Gillard knifed KRudd, she has been on a borrow-and-spendathon that puts even the jet-setting Mr Stimulus to shame. 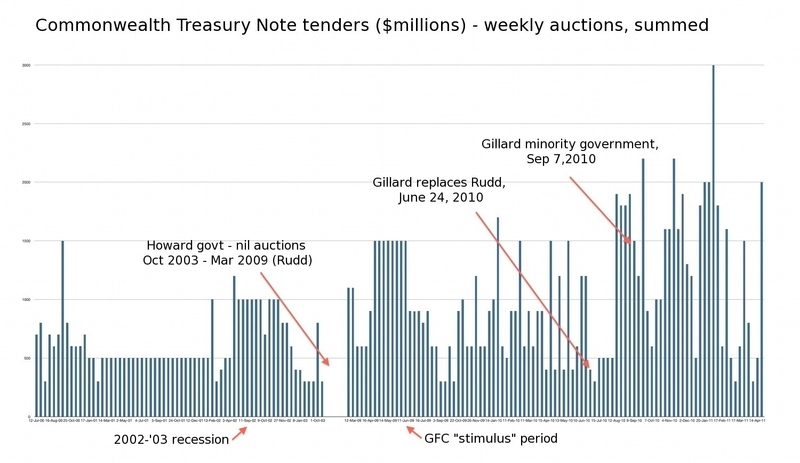 The following chart shows only the value of Treasury Notes auctioned by Labor. These are “short term” debt “instruments”, that typically must be repaid within 30-90 days. They are supposed to be issued only when necessary to “smooth” cashflow requirements of the government. Most of the government’s primary funding comes, instead, from the auction of Treasury Bonds, which are longer term debt “instruments”, that must be repaid over durations of anything up to 20+ years. Note carefully that this chart only goes up to end of April this year. During May, the government borrowed another $5.8 Billion using Treasury Notes. To picture this – since I’m too lazy to update the chart right now – just imagine another blue line on the end of that chart, one that is double the height of the tallest blue line. So far in June – a mere 3 days in – they have already borrowed another $500 million using T-Notes. And next Thursday 9th June, they will borrow another $1 Billion using T-Notes. Ha, Ha! “the jet-setting Mr Stimulus”, that’s a good one! Regards Treasury notes, I’d add that the money markets are at present having no trouble accommodating the governments short or long term debt issuance but like any credit bubble it can turn in a dime. I posit this happened in 1997. Your point “supposed to be issued only when necessary to “smooth” cashflow requirements of the government” is a good one. The government seems to be already having trouble with its finances, what happens when the market is, quite possibly suddenly, no longer so accommodating, when our creditors begin hitting the bid rather than taking the offer? Given that Treasury Notes are short term instruments, focusing on the stock rather than the flow (or half of it, given you don’t seem to be capturing maturities) might be more compelling, albeit less sensational. Still, in the interest of balance, I’m sure Wednesday will see an article on the repayment of $11 billion upon the maturity of the June 11 ACGB. Or would successfully repaying debt prove that Barnaby wasn’t quite right after all? Abe, most people in the community don’t have any understanding at all about the mechanics of how government raises money, or even know what a T-Note is. Much less the deeper obscurantism surrounding stocks vs flows, maturities et al. Your reference to the government’s repaying of some debt wilfully overlooks the fact that, in paying out on previously-issued debt on maturity – as they are legally obliged to do – in reality they are merely rolling over old debt, by continually creating ever-more new debt. Hence why the total of Commonwealth Government Securities on issue continues inexorably to rise. Furthermore, in specific context of T-notes, see my previous posts on this. The AOFM website clearly specified in 2010 that use of T-notes as short-term debt instruments was not expected to make a significant contribution to the government’s liquidity in the year ahead. Clearly, they have. The implications for government mismanagement are patently obvious. Could you point me to this statement from the AFOM of 2010 pls? Certainly Abe. I’ve quoted it, including the link, here (near end of article). That second link to the AOFM website says they plan to keep a minimum of $10bn outstanding – has it been updated or am I missing something please? In any event, let’s assume it was there previously too. It only damns them the more. The last time I checked, the AOFM’s portfolio overview indicated they’d already blown through that figure by June 30, 2010, had hit $18bn (face value) of T-notes on issue at end Sept, almost that still at end Dec 2010, and still had something in the order of $15bn on issue at end of March 2011. Sure, but there are significant mismatches between revenue and expenditure, so the number at any point in time within the year is pretty meaningless. I’d keep an eye on the year end balance, personally. No Abe, it’s not meaningless at all. That’s the basic point I’ve been trying to clarify with you tonight. (1) Their claim about T-notes not expected to represent a significant proportion of funding has turned out somewhat inaccurate (Why?). (2) If the point made in the recent May update viz. “at least” $10bn on issue at all times also appeared previously, then it is clear that they have almost doubled that amount during at least half the year (two quarters) … again, pointing to my interpretation that they are not managing “daily cashflow” needs of govt well (esp. in contrast to previous Govt). (3) The Interest bill arising from issuance of T-Notes in particular is/will quite obviously be rather higher than originally estimated … a fact borne out in the $5.69Bn blowout in the total forecast Interest-on-debt bill, in just 6 months from Nov 2010 to May 2011.